In part 42 of our 894 part series, we take a look at the man with greatest name (as well as an impressive mustache) in franchise history, Billy Jo Robidoux. Billy Jo Robidoux (pronounced Roe-Buh-Dough) was born in Ware, Massachusetts, in 1964. A left-handed hitting first baseman, Robidoux was a 6th round pick by the Brewers in the 1982 draft. From the get go, it was clear that Billy Jo Robidoux could hit. His career minor league batting average would be a robust .308. And he walked more than he struck out. He hit .287 as a rookie. Then as a 19 year old at A- ball, he hit .317 wit 10 HR. But Robidoux would break out in 1985 as at AA El Paso, hitting .342 with 23 HR and 123 RBI en route to winning the Texas League MVP award. For his efforts, Robidoux would get an 18 game trial with Milwaukee. He would hit 2 HR and drive in 4 runs in the final game of the season - a glimpse of good things to come - or so thought Brewer fans. For many Brewer fans, Robidoux represented a chance to incorporate an exciting young hitter into an aging line up (guys like Cooper, Gantner, Yount, Oglivie, and Moore with 30 and older). The next season, 1986, Robidoux would get a chance to play when Cecil Cooper was injured. The big 1B started out well, hitting .290 over the first six weeks of the season (although with little power). However, he would injure his knee, sidelining him for month. When he returned, he was not the same player. In a slump - and not playing full time - the Brewers sent Robidoux to the minors for two months. When he returned to the Brewers, his problems continued, and he would finish the season hitting just .227 with a single HR in 56 games. In reality, Robidoux's chance had come and gone. Injuries would dog Robidoux and he would play in only 153 games total in 1987 and 1988 (56 of those were in Milwaukee, the rest at AAA). But the magic hitting stroke was now gone. Even at AAA he struggled to be anything more than ordinary. In Milwaukee, he struggled, hitting .194 and .253, respectively, in limited action. Granted free agency after the 1988 season, Robidoux signed with Chicago. 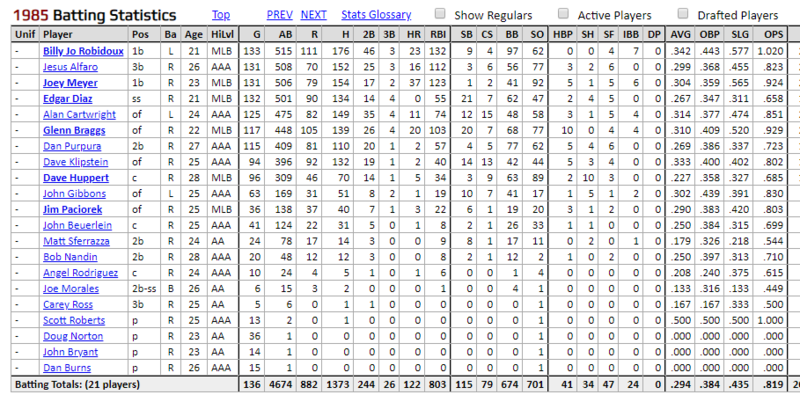 He would hit well at AAA, but fail to register an impact at the big league level, hitting a meager .128 in 16 games. He would move on to Boston the next season, winning the 1B job out of training camp. However, he would struggle to hit in the first month, then (again) injure his knee. His career was, essentially, over. Billy Jo Robidoux was 26. I could not find out a lot about Robidoux's post-baseball career, other than he returned to his hometown, Ware, Massachusetts, working for the city's highway department. He has stayed involved in baseball, umpiring at the high school and college level. He remains part of the Brewer family, participating in past fantasy camps. Billy Jo Robidoux had an unremarkable career. He hit .209 with 5 HR on 468 at bats in parts of six years - most in Milwaukee. His 13% walk rate is probably the one thing you can highlight about his time in the big leagues. Without question, his knee issues hampered his once-promising career - not unlike other baseball players, such as Mat Gamel. However, while Robidoux never hit at the major league level, his 1985 season was one of the finest in Brewer minor league history. A 1.020 OPS, 97 BB vs only 62K, a .342 BA and 23 HR. That was stuff that made Brewer fans drool. But unlike today, those shiny numbers were masked by context. Robidoux's team, El Paso, hit .302 collectively. Yes, Robidoux had a great year. But in context of the extreme hitter's park he played in, our expectations should have been tempered. Alas, it was not be, and Billy Jo Robidoux would go down in Milwaukee Brewer history as one of the organization's most disappointing prospects. Still, no one could take away the man's name. When someone looks for the most unusual names in baseball history - Billy Jo Robidoux often shows up on their lists. Feel free to share your memories of former Brewer 1B Billy Jo Robidoux. Blast from the past. I remember reading the paper and keeping up with him at El Paso as I also did with Randy Ready earlier. I was excited about him because his stats were so good. I was going to make a Mat Gamel reference but you were already ahead of me. I was very high on Mat’s hit tool. I don't remember much about Billy Jo, but I do remember he was the first of those lenticular baseball cards I ever had (the kind where the image on the card shifts as you tilt it from side to side). I think he was already basically done with the team when I got it. Yeah Sportsflics cards. He had his own and a team card with Yount/Riles/Deer and him on it. 1986 was the first year I really started collecting cards as a kid and really wanted a Robidoux card at the start of the season but none of the card companies (Topps/Fleer/Donruss) had them. By the time the update sets came out late in the year he was having a pretty bad year and the demand for his cards was way down. As a kid, I remember Uecker doing the same over the radio. For as little as he ended up playing, his name has stuck with me all these years! I followed him a lot, too -- Sporting News when they'd have minor league team stats, plus the minor league updates in the "What's Brewing" magazine -- and was so pumped when he came up. The knee injuries did him in. So disappointing -- not in him, but for him, and thus also for us as Brewers fans since we'd never get to see what he seemed certain to become -- the mid-'80s version of Mat Gamel for sure -- all he did was hit! Agreed. I just loved that elongated ending. I was so wrong about him—thought he was going to be a 40 double 20 homer guy who hit .290 to .310. Loved his crouch too. He just hunkered down, smooth swing, man oh man I thought he was the real deal. Had he worked out, the Brewers likely wouldn't have been in on Greg Brock and then Franklin Stubbs. That's not on him, but more a reflection on where they were financially and in talent evaluation.